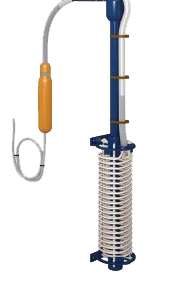 GALMAFORM heating elements are specially designed for direct electrical heating of fluids in systems and tanks that require minimum installation dimensions and excellent resistance to highly aggressive process liquids. The very good chemical resistance is ensured by the use of a special coating in fluoropolymer PFA (perfuoroalkoxy polymer). The fluoropolymer coating consists of two layers. The black PFA compound inner coating of the GALMAFORM heating elements increases thermal conductivity and ensures good heat transfer to the liquid, while the pure fluoropolymer exterior coating prevents deposits and facilitates cleaning. 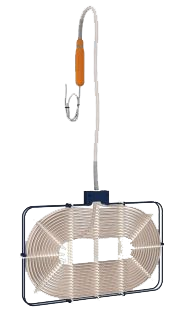 The rod heaters consist of a stainless-steel heater tube coated with PTFE and with the electrical connections at one end. 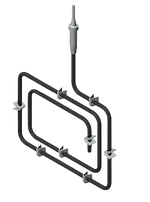 The contact box and the PTFE cable are welded together with a gas-tight seam, which means that they are completely submersible. The heated length of the rod (minimum immersion depth) is indicated by a permanent ring-shaped mark. The rod is not heated above this mark. 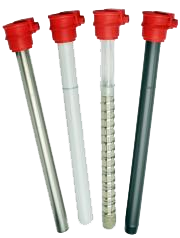 Even in applications where the liquid level varies gretly, the heated part of the rod must always be submersed! 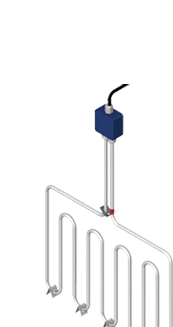 The distance pieces ensure that the necessary gap between the rod heater and the wall of the tank is maintained.